CAN YOU NAME THAT THING? This thing is the newest member of our family. 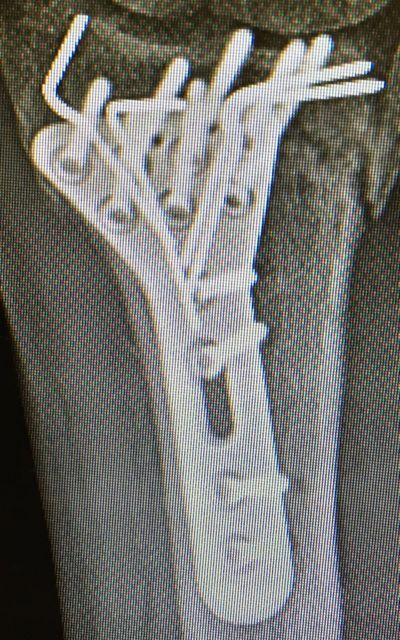 It lives in my husband’s right wrist and Craig is playing heavy-metal ukulele these days whether he likes it or not. We have one final appointment with Dr. Kodi Azari, the hand surgeon, and it is the same routine one expects at a teaching hospital like U.C.L.A. First to appear is the new resident doing ortho rounds. She enters with a burst of warm exuberance and tells us that her name is Ro-Q-Something-Something… “But you can call me Rocky,” she exclaims. “Well let’s see your wrist.” She is mightily impressed with Craig’s range of motion. My musician husband is very motivated… “I wish all our patients were doing this well. Let’s look at your X-Rays.” As she tappity-taps on the computer keyboard the newest films, taken ten minutes earlier, appear. She zooms in for a closer look. And so do we. Like what the hell is that? For the first time we get an IMAX view of the “thing” the surgeon cajoled into the bones of my husband’s wrist. All smiles, Dr. Azari joins the party and announces that he’s very pleased with Craig’s progress. And relieved. Because the damage was so extensive. Now it’s on to physical therapy for the next few months. 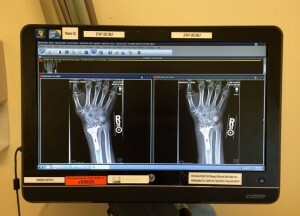 If his wrist appears in one of those fancy orthopedic journals, I’ll let you know. He is only the third patient to receive this metal sculpture. It goes without saying that we are extremely grateful that Craig has excellent medical insurance through his work and by sheer luck, we landed in Dr. Azari’s office. May remind you that all this happened because Craig tripped on a plane-jane sidewalk in front of our busy post office in Culver City. Some sidewalks in Los Angeles arch upward like an A-frame roof on a ski chalet. In earthquake country… You see them coming and walk thoughtfully over the hills and valleys. But the sidewalk panel that is just a teeny-tiny bit displaced from its neighbor panel…that’s the one to stare down. So here is a big shout-out to the scientists, future scientists and the insatiably curious people in the world who find a need and then find a way to fill it, build it, discover the cure, unlock the mystery. I meet one of these people at The Los Angeles International Ukulele Festival at the merchandise booth. His name is Jason. Teachers and performers who inform and entertain at festivals also want to sell stuff. Like our music…our DNA that we have spread onto a compact disc like butter. But we are off teaching or performing. What to do? 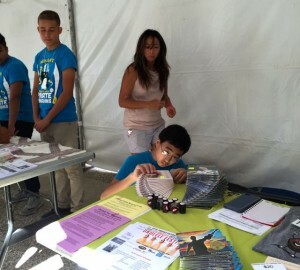 Thank goodness high school kids in Los Angeles have to put in so many hours of volunteer work in order to graduate. A swarm of them from Torrance appear on the scene wearing matching blue shirts, bright morning smiles and are ready to do what needs to be done. I’m getting the impression they take their work today very seriously. They emit an air of gravitas that I associate more with tired middle-aged folks with a 30-year mortgage, car payments and children. About a half dozen oversee their slivers of space at the long merchandise tables and sell sell sell. They already have my undying admiration since the last thing I want to do on this planet is sell, sell, sell. After The CC Strummers and I open the festival on the big stage in the plaza, I run back to the merchandise table and that’s when I meet Jason. He is leaning into a stack of my “Smile, Smile, Smile” CD’s and arranging it in a beautiful swooping geometric form. Earlier I had plunked them down on the table and disappeared, but Jason, he fills the void. And with stunning attention to detail. I’m thinking he might pull out a tape measure any second to get the width, depth and height just right. This young man stands at the intersection of art AND science. “Are you an engineering student? I ask. The young ladies hovering close answer “ye-e-e-e-e-s” in surprising unison, like they are his back-up singers or something. This is a treasure of a moment. Oh the sheer beauty of it all and the gifts we bring “literally” to the table. Jason sells lots of CD’s and demonstrates my Rhythm Rings so ukulele players can “shake and play” at the same time. And I miss the whole thing. But at the end of the day I do manage to scoop up the $$ Jason has neatly arranged (in order or denomination) in my Estee Lauder freebie cosmetic zip bag. I am convinced that whatever we do, at any given moment, it takes a village. It may not seem that way sometimes, but… Sure I’m writing this blog on my computer. I’m all by myself. But what about the people who designed this computer and built it and the UPS guy who delivered it? What about the folks who keep the electricity running? What about my teachers—all of them—who are present and accounted for in every word I type? What about my husband who has my back? Community is a marvel. A miracle of engineering. 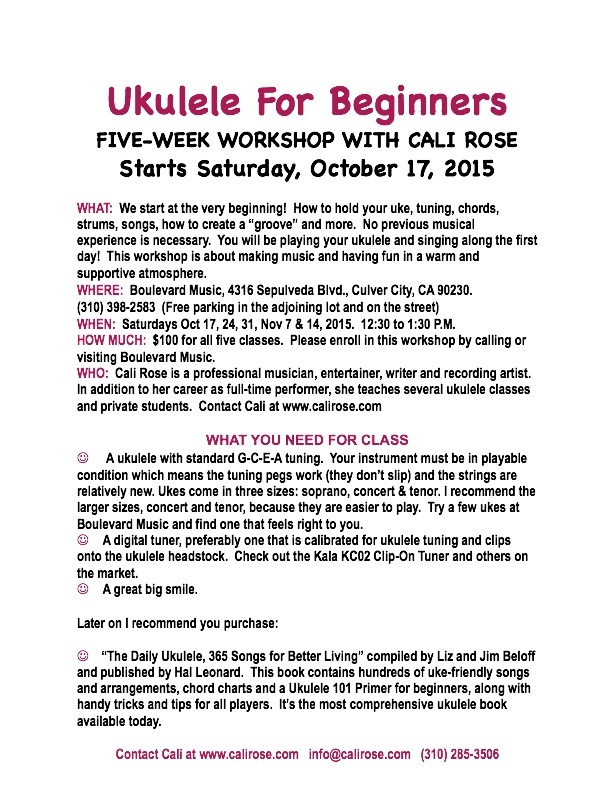 My next “Ukulele For Beginners” Class starts Saturday, October 17, 2015 in Culver City. Playing this marvelous instrument does the heart good. Sign up at Boulevard Music. 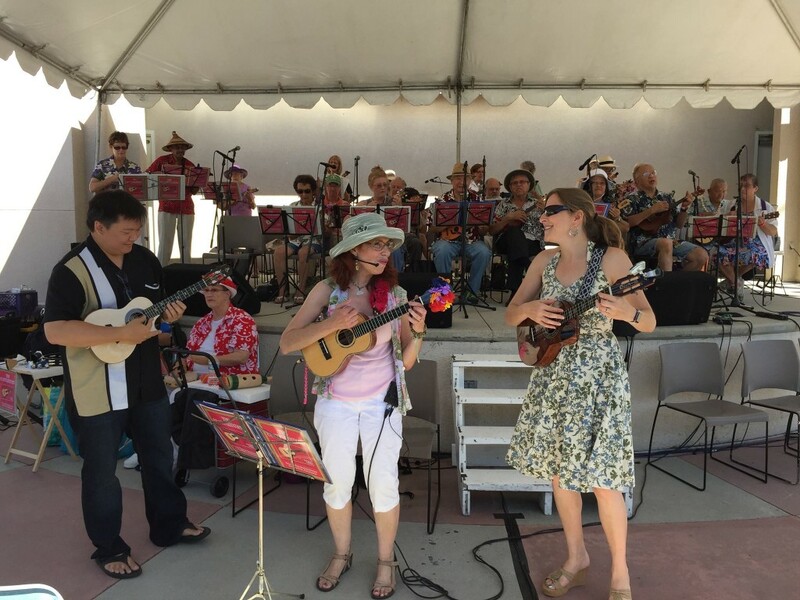 The CC Strummers, Craig Chee, Sarah Maisel and myself at The Los Angeles International Ukulele Festival. September 2015. Thank you Tammy Martin Cobos for the picture. Thanks for sharing. 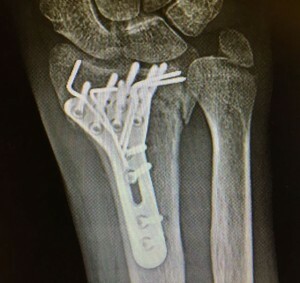 Hand surgeons are probably the most creative out of all surgeons! Cali Rose, thanks for your uplifting missal of everyday happenings for which we can be grateful. I’m turning 80 next month and while losing some dexterity (having trouble barring sometimes because of shrinkage in my fingers), I am still excited each time I pick up my uke when something resembling music emanates from that beautiful instrument. Keep well…continue to be a catalyst of joyful community. Fabulous blog, as always. 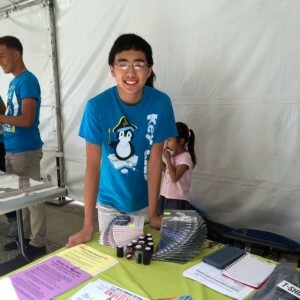 Your writing is effortless, moving from engineered wrist to Jason the engineering student, to the community – a miracle of engineering. Beautiful, and brought tears to my eyes.